Collecting Vintage and Contemporary Jewelry: Jewelry Trends for Fall 2012 - Gold Tones, Earth Tones, Natural Materials and Statement Pieces. Jewelry Trends for Fall 2012 - Gold Tones, Earth Tones, Natural Materials and Statement Pieces. The leaves are falling, the days are cooler and thoughts go to fashion choices for heavier clothing. I thought it would be fun to see what seems to be the trend for this autumn season. One can't go wrong with turquoise. It has sold well all year and continues to be one of my best selling materials. Combined with glass and other stones, it's a real trend setter. This pretty set is a lovely example of glass and turquoise with some ceramic style beads as well. All of the above pieces are statement designs. This trend continues and the pieces seem to be getting larger and larger. 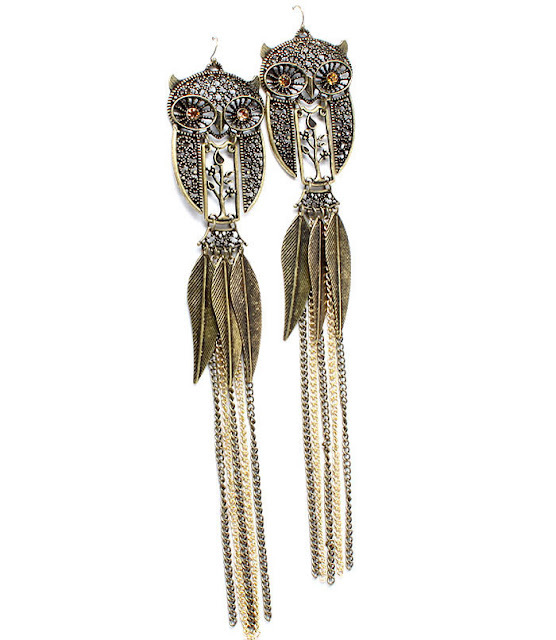 These long owl earrings are 9 inches from top to bottom. In the popular gold color, they will indeed make a statement when worn. What do you think of the looks for fall? Do you like big statement jewelry, or do your prefer something smaller and more delicate? Thanks for sharing! It's nice to Gold Tone will be in this season! The Bohemian inspired necklace and earrings are so lovely as with all your jewelry. Hint Hint to my husband. The feathers are totally flattering! love everyone of these creations...thanks for sharing.. I have found most gold plated pieces do not last very long....unless they are vintage Monet, Sarah Covingtry and one other I can't remember. Gold filled and actual gold are just way too expensive for me...big sigh. 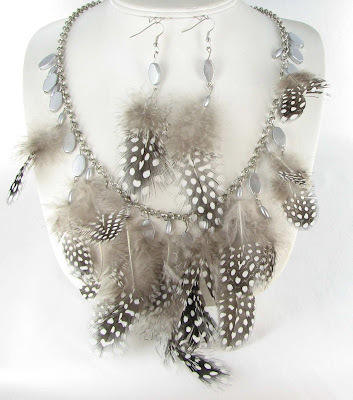 I too like big bold jewlry designs for fall Love the feather piece! !